Donors needed on this Saturday, May 12. 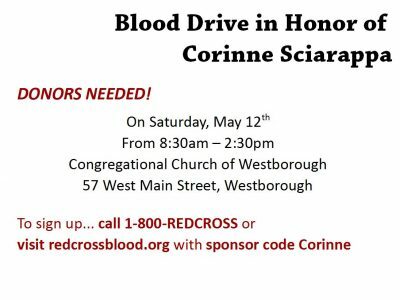 There will be a blood drive in honor of Corinne Sciarappa. It will be held at the Congregational Church of Westborough, located on 57 West Main Street. From 8:30am to 2:30pm. This will be the 10th blood drive in her honor. All donors have a chance to win a pair of Red Sox tickets and be honored as the Blood Donor of the Game. There will also be pizza and baked goods available. To sign up call, 1-800-REDCROSS or visit, redcrossblood.org and use sponsor code Corinne.